A confrontation on a Manhattan street has triggered the emergence of the hashtag #Thisis2016. 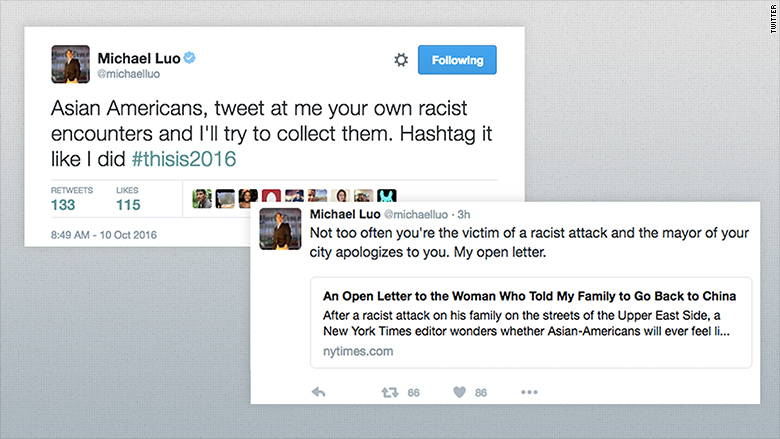 In a season of heightened racial tension, the hashtag is being used to document racist moments Asian Americans have faced in the U.S.
Michael Luo, a New York Times editor, started the trend Monday after he shared his own experience over the weekend. He told CNNMoney he has received "an avalanche" of responses. "It's resonating because Asian Americans have this feeling that racism against them is not taken as seriously as other groups," said Luo. This is the second time in recent days that a hashtag has helped users share a painful experience. On Saturday, it was "#notokay," which marked tweets from over a million victims, mostly women, of sexual assault. Luo was walking on the Upper East Side of Manhattan with his family and friends on Sunday when a woman in her late 40s or early 50s shouted to the group, "Go back to China...go back to your f---ing country." He ran after her and yelled, "I was born in this country!" His 7-year-old daughter later asked why the woman said "go back to China" instead of "go to China." "She keeps talking about it," he said. "She's really analyzed the grammar of what the woman said." Luo recounted the incident in a series of tweets which have been shared thousands of times. The posts even prompted New York Mayor Bill de Blasio to react. "I've never met the mayor, so I was surprised that he responded," Luo said. The tweets struck a nerve with many Asian Americans. "It [was] a reflection on 'otherness' ... this feeling of 'Are we ever going to feel like we belong?'" In addition to serving as the Times' deputy metro editor, Luo helps edit the paper's Race/Related team. His second role is partially why he wanted people to open up to him online. Luo said he hasn't been able to keep track of how many people have been using the #Thisis2016, which existed before this week. Responses have also been coming in through email, on Facebook, and in the comments section of the open letter he wrote on The New York Times. "It's honestly incredibly moving," he added, pointing to several recent tweets he had received, including one from a man who has trouble dating online because of his race. Among those who used the hashtag was Dorothy Jean Chang. "Too many for 1 tweet. In sum, living in NYC, I still regularly get: go back to China, hello China doll, konichiwa #thisis2016," she wrote. Tim Lau tweeted, "My history teacher asked in class 'Is your Chinese name Ching Chang Wang? I heard all Chinese names sound like that' #thisis2016." The feeling of being a perpetual outsider was at the forefront of Luo's mind because of the political climate and Fox News' controversial segment on Chinese voters. One of the network's interviewers used racial stereotypes while asking people in Chinatown about this year's presidential campaign and U.S.-China relations. Luo said he hasn't gone back to where the incident happened Sunday, nor has he tried to track down the woman. "I'm not sure it would be a productive," he said of a potential meeting. "The interesting thing is that when I confronted her, she responded ... upped the ante and doubled down."